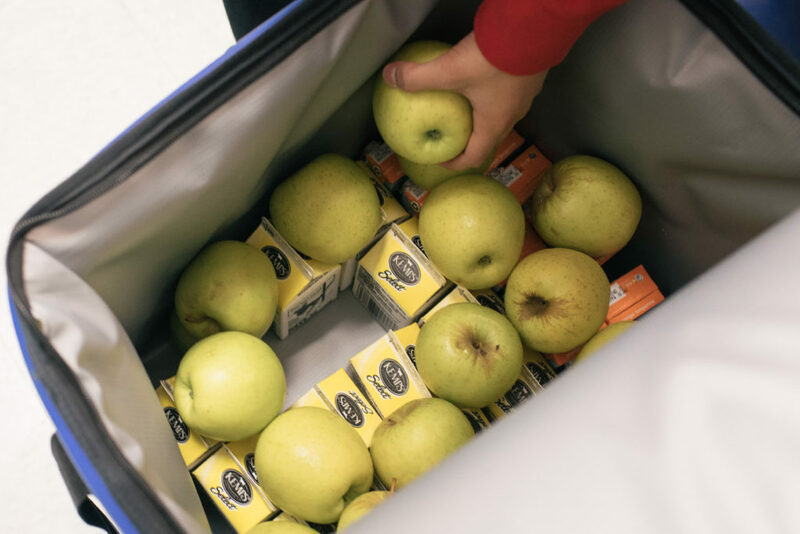 Helping connect students with the meals most critical to their success. Party and a Breakfast at Michele Clark H.S. DeKalb SD 428 Shout Out! After receiving a $13,800 grant from Rise & Shine Illinois and Share Our Strength’s No Kid Hungry campaign the DeKalb School District began its Second Chance Breakfast Program. Students can grab a nutritional breakfast after the bell rings and between first and second period. The full story can be read on the Daily Chronicle’s website. National School Breakfast Week (NSBW) is the first week in March and was established to raise awareness of the availability of the School Breakfast Program to all children. During this week, schools put their breakfast programs on display. 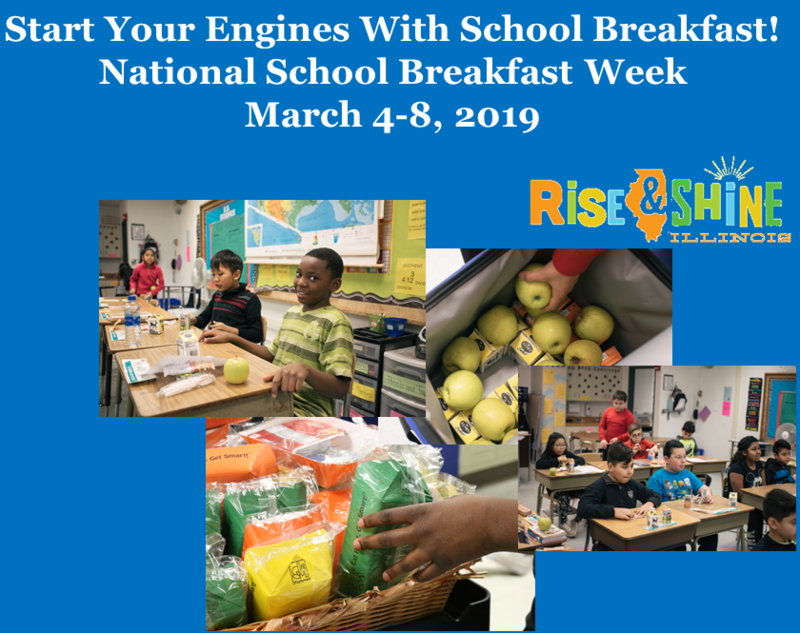 The #NSBW19 theme is “Start Your Engines With School Breakfast,” which is designed to show parents, students, and school officials the benefits of fueling up for the day with a healthy school breakfast. Apply for a Breakfast After the Bell grant before the March 4th deadline. If you have already received a grant from us and are seeking additional funds email Sr. Manager of Children’s Nutrition and Advocacy Outreach, Monique Batteast at mbatteast@gcfd.org. Email Communications Associate Manager, Rudi Hancock at rhancock@gcfd.org with a few sentences and a couple of pictures of what’s going on in your school during this week/month. We will shout out your school’s activities with posts on Rise & Shine Facebook and Twitter Pages. 4. 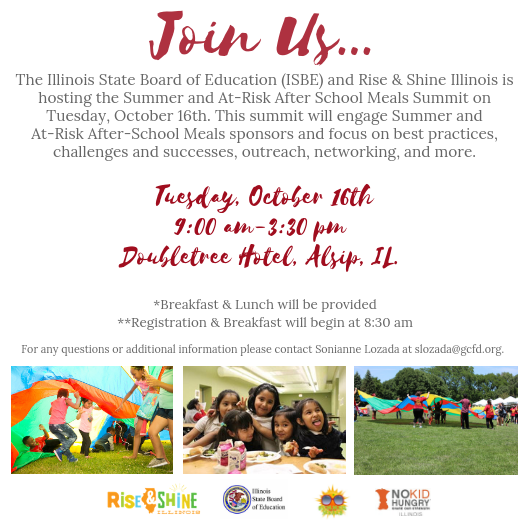 Encourage one colleague or friend to sign up for the Rise & Shine Illinois monthly e-newsletter. 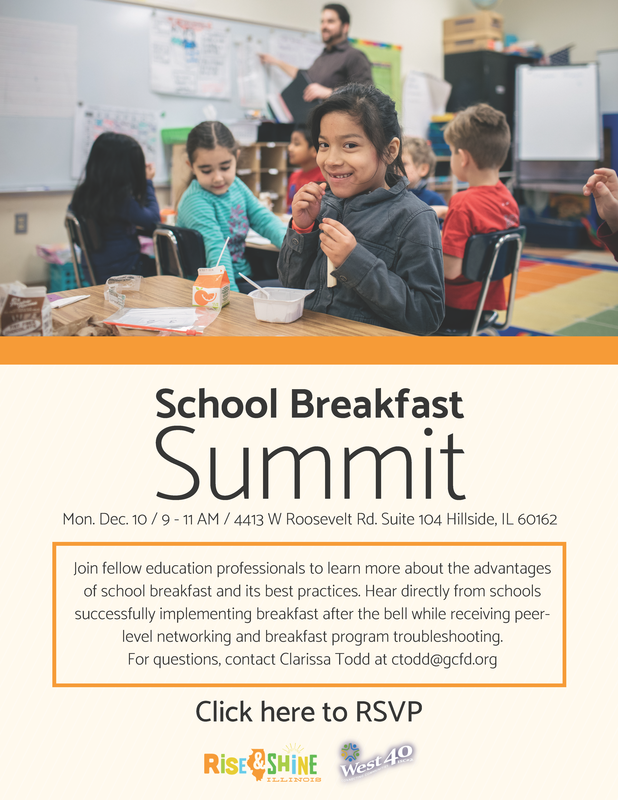 Peer-to-Peer site visits provide schools/districts considering implementing or have already implemented a Breakfast After the Bell program with the opportunity to see how the Breakfast After the Bell program works live and in action. The site visits also provide a networking opportunity for schools/districts. Rise & Shine Illinois will host a Peer-to-Peer site visit at Elmwood Park High School (Second Chance Breakfast Model) located at 8201 W. Fullerton Avenue, Elmwood Park, Friday October 5, 2018 from 8:45 a.m. – 10:30 a.m. For more information and to register click here. Rise & Shine Illinois will host a Peer-to-Peer Site Visit at Perspectives Charter School (Grab ‘N’ Go Breakfast Model) located on 8131 S. May Street, Chicago, Tuesday, September 25, 2018 from 7:30 – 9:00 a.m. For more information and to register click here. Rise and Shine Illinois in partnership with No Kid Hungry will provide Breakfast After the Bell grants up to $5,000 to support schools with the purchase of approved equipment, materials and initiatives facilitating Breakfast After the Bell delivery models such as (Breakfast In the Classroom, Grab ‘N’ Go, Second Chance). Click grant for more information and to apply. CONGRATULATIONS 2018 SUMMER MEAL PROGRAM GRANT RECIPIENTS!!!! 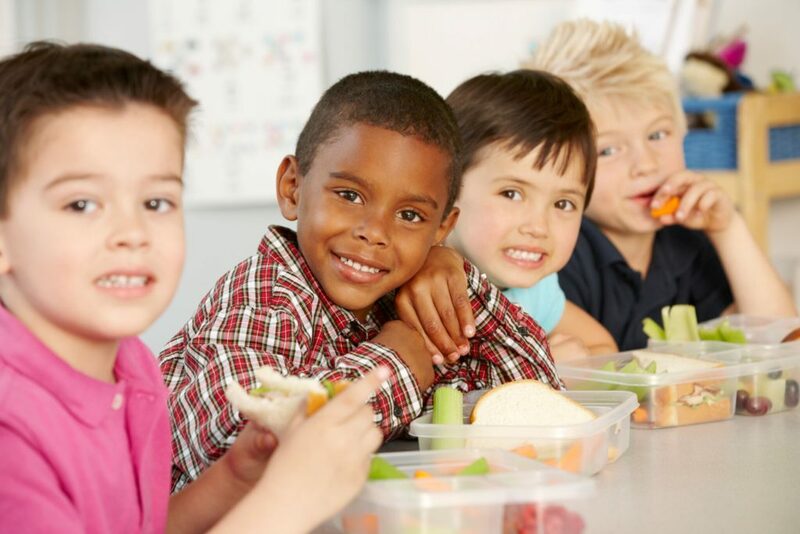 Rise & Shine Illinois in partnership with No Kid Hungry provided grants to help organizations expand access to and participation in the United States Department of Agriculture (USDA) supported and Illinois State Board of Education administered Summer Meals Program. Rise & Shine Illinois School Breakfast Grants brought to you by No Kid Hungry supports schools implementing or preparing to implement a Breakfast After the Bell delivery model (Breakfast in the Classroom, Grab ‘N’ Go, or Second Chance Breakfast) with the purchase of approved equipment, supplies, or materials to facilitate increased student participation in school breakfast. 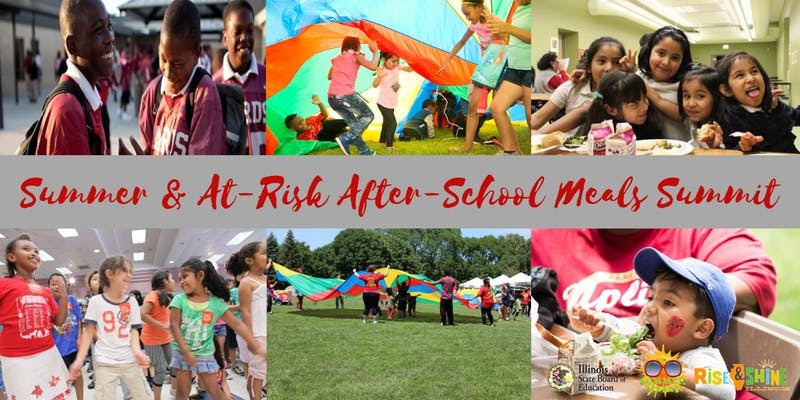 Join Rise & Shine Illinois and Action for Healthy Kids Tuesday, April 24, 9:00 a.m. at the Regional Office of Education in Loves Park for a health and wellness training that will include a discussion on Breakfast After the Bell and Game On. Breakfast After the Bell: Starting in the 2017-2018 school year, Illinois schools with 70% or more of the student population eligible for free or reduced–price meals will begin offering Breakfast After the Bell – which means serving breakfast as part of the school day. Breakfast as part of the school day increases access to the nutrition all students require each morning to learn and succeed in the classroom. Game On: Creates healthier environments for students, staff, and the communities they serve. The training is free. Superintendents, principals, teachers, administration staff, food service professionals, and community members are encouraged to attend. Participants will receive 3 Professional Development Credits (PDCs). Click here to register. Please refer all questions to Maggie O’Connor at 773-843-778 or email moconnor@gcfd.org. 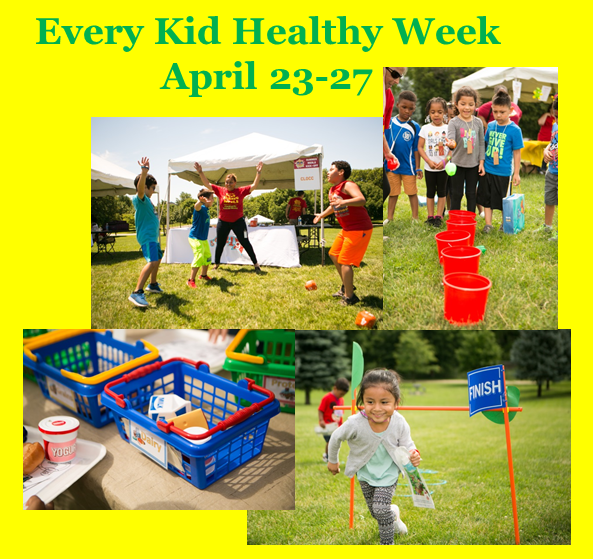 Rise & Shine Illinois is partnering with Action for Healthy Kids to celebrate the sixth annual Every Kid Healthy Week, a national health observance that shines a light on the great efforts schools are making to improve the health of their students. Every Kid Healthy Week recognizes wellness achievements in school communities. Visit Action for Healthy Kids for resources and a toolkit to engage staff, students, parents and community members in a celebration of school wellness. Highlight your school breakfast program – promote a new breakfast item, revamp your menu, and/or hold a taste test of potential new breakfast items. Host a family fitness night – an event that involves physical activity and healthy eating can help you share positive messages beyond the classroom by engaging and educating parents and motivating students to practice healthy behaviors at home. Organize a Health and Wellness Fair – an opportunity to engage students, parents, and the entire community in healthier eating and physical activity. Gather the community for a Fun Run – Runs, walks, and races are a great way to get students outside and moving. They also teach the value of competition, sportsmanship and can encourage teamwork to achieve a common goal. 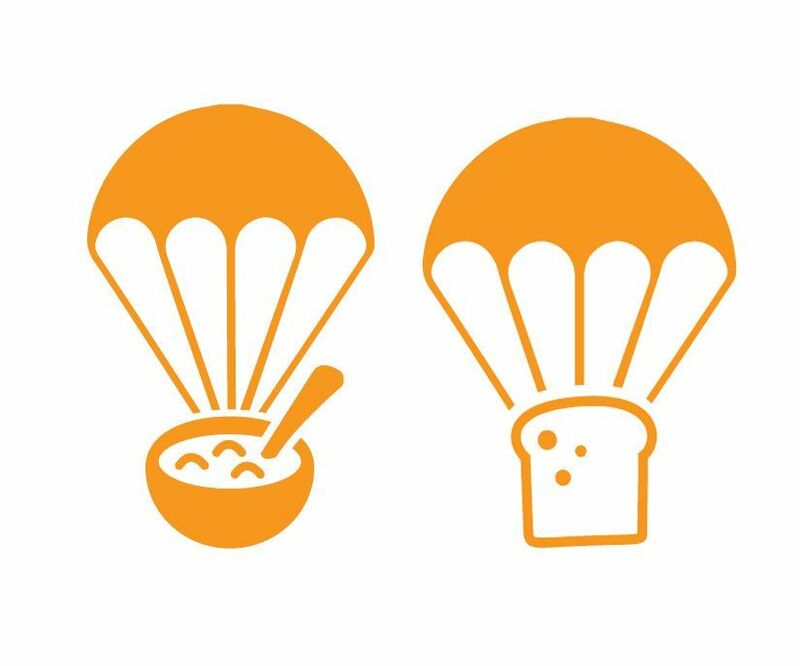 Apply for one of Action for Healthy Kids school grants: Visit Action for Healthy Kids to learn more about School Breakfast, Game On, and Parents for Healthy Kids grants. Applications are due Friday, April 6. Sign up to receive email updates from the Rise and Shine Illinois campaign.